I left the house early as I headed off down the M25. The sun was peeking above the horizon and promised to be a beautiful day. I had most of the morning to give Staines Moor, my first port of call, a good search, and then the Reservoir if there was anything interesting to see. The target bird today was Yellow Wagtail and I was also on the lookout for Whinchat. 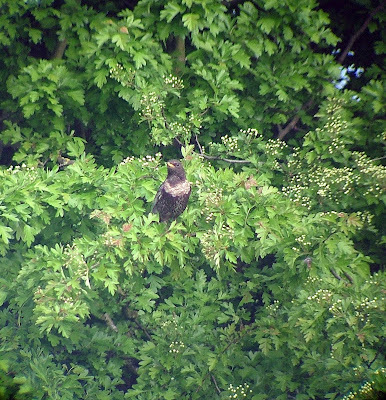 Yesterday a female Ring Ouzel had been seen at Staines in the morning, but had gone missing in the afternoon. It could well have moved on, so I didn't think anymore about it. The walk down from Hithermoor Road along the footpath is always a good start to a walk at Staines Moor. At this time of year the key bird along the path is the Sedge Warbler. 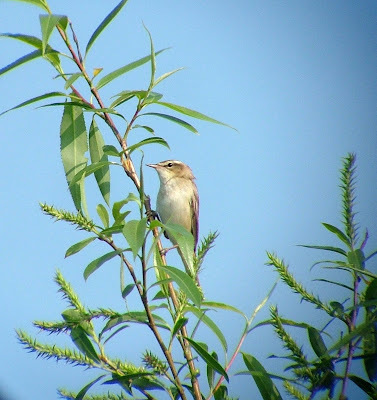 There are at least three vocal Sedges that are currently showing really well. 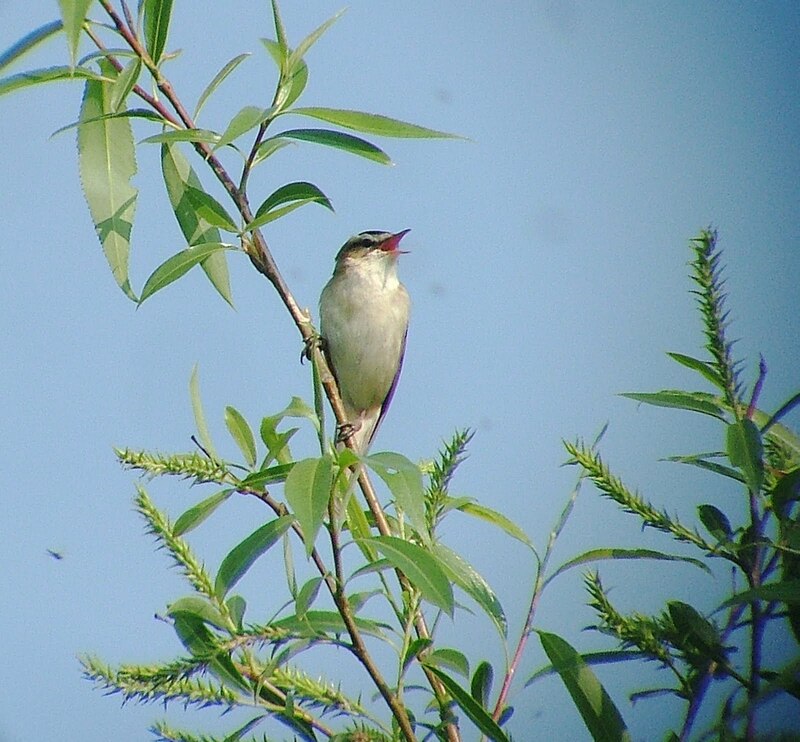 Also along the path are plenty of Blackcaps, Chiffchaffs, Whitethroats and Willow Warblers. Once off the concrete footpath and through the gate towards the Moor, there are plenty of birds to keep you occupied before the wooden walkway to the Moor itself. This morning I saw a Great Spotted Woodpecker drumming, and heard more Sedge Warblers as well as a number of Reed Warblers chattering in the reeds on either side of the path. My plan once on the Moor was to head to the northern side of the River Colne, an area I don't normally cover. 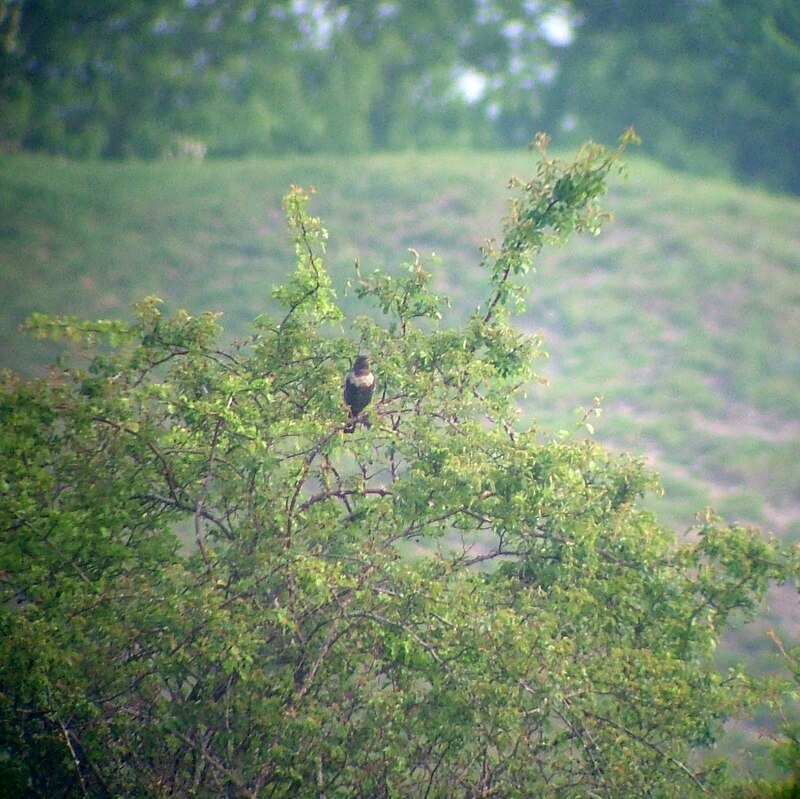 It was also where the Ring Ouzel had been seen yesterday. Once over the bridge I came across plenty of Wheatear, a couple of first-summer males and at least six females. I carried on walking west when I briefly saw a black bird with silvery wings fly up into a tree. I didn't see exactly where it went or for long enough to identify it. 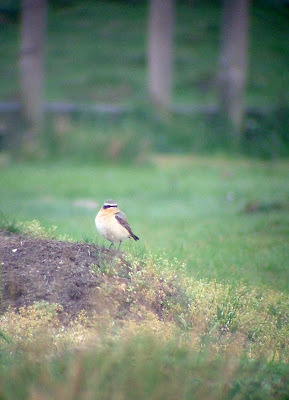 A few minutes later Ripley birder, Glyn Bridges, joined me for a stake out. Unfortunately for Glyn, the bird didn't reappear and he was on a tight schedule. Half-an-hour later at 7.40am Glyn had to go, by which time we were joined by local birder Pete Naylor. We both did a tour of the area but couldn't find any sign of the Ring Ouzel. I then went off in search of my target bird, focusing on a group of horses that had gathered by the river. 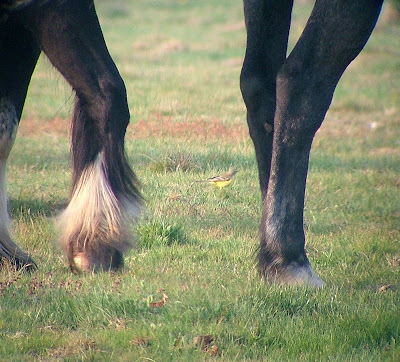 It didn't take long to see a Yellow Wagtail (127) feeding close by. It stayed for a few minutes before flying off north. Back to the Ring Ouzel hunt, I searched everywhere in the area, including where a disused trailer had been ditched, but nothing. By 8.15am I decided to head back and go over to the Reservoir. 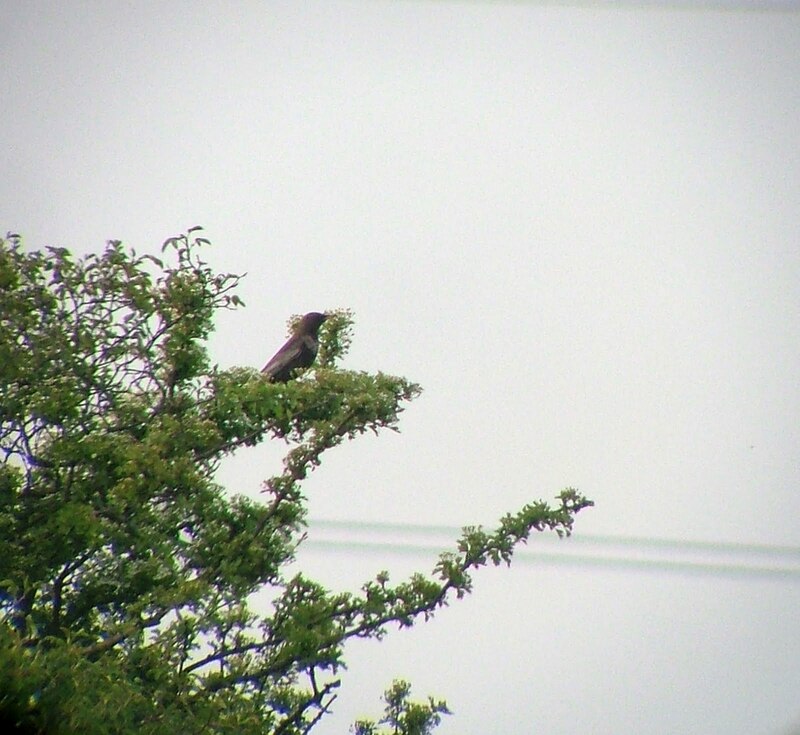 I'd seen a Ring Ouzel at Canons Farm recently, so it wasn't the end of the world if I didn't see another. I texted Bob Warden to see if anything new was on the Reservoir - particularly Black Tern - but there was nothing of note. The Terns, Arctic and Black, tend to turn up in the afternoon, so, apart from the Great Northern Divers and Velvet Scoter - both of which I had seen already - there was nothing new on the water. Just then a black bird flew out of a tree right in front of me making a distinctive 'tuk, tuk' call as it flew. It was the female Ring Ouzel. It flew off into another tree about 100 yards away, long enough for me to get a record photo, and then it decided to fly into the tree where I had originally seen it, which was only 20 yards away from where I was standing. Great stuff. From his viewpoint, Pete had locked on to her, too. 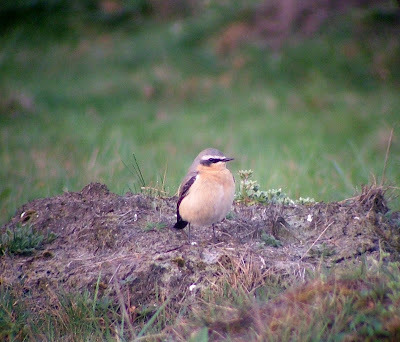 I got fantastic views of this little beauty, but before long the Rouzel was up in the air again and doing a circuit of the area before landing in another nearby tree. She then dropped on to the ground before I eventually lost sight of her. Warm sunshine, plenty to see and a second Ring Ouzel sighting in a matter of a couple of weeks - more than I could have hoped for.